Baker vs. Liriano: Who’s the Ace? From 2004 to 2007, Twins fans had the pleasure of knowing their pitching staff was being led by the best pitcher on the planet, Johan Santana. No matter if he pitched against the Yankees or the Royals, Santana seemed able to win every game he started. When Santana stepped to the mound, the crowd became livelier, the Twins oozed more confidence, and the opposing teams sweated and shook a little more at the plate. The Twins had the epitome of what an ace should be, something they may not get out of another pitcher for years to come. Johan will never be replaced, but after a 2008 season with no discernable ace in the staff, the Twins need one of two men to step forward in 2009 and lead the rotation. Will Scott Baker and Francisco Liriano please step forward and present your arguments for being the Twins staff ace. Francisco Liriano burst onto the baseball scene in 2006, compiling obscene numbers for a rookie pitcher before succumbing to injury in September before the playoffs. Twins fans will always wonder what may have been if Liriano had been healthy for the ’06 playoffs. A Santana-Liriano top of the rotation seemed unstoppable as they both posted ERAs under three and WHIPs of .997 and 1.0, respectively. Instead of a deep playoff run, Twins fans watched Frank “Big Hurt” Thomas waddle his rotund body around the Metrodome base paths and help the A’s sweep the Twins. Retire already Big Hurt. All Twins fans will rejoice. Following the season, Liriano had Tommy John surgery, sidelining him for all of 2007 and causing pundits to wonder what pitcher Liriano would be upon his return. Liriano returned to the rotation in April of last season and was clearly not the same pitcher who out dueled Roger Clemens on national TV. His velocity was down and his control was awful. After three starts and an ERA of 11.32, Liriano was sent down to the minors to learn how to pitch again. After being demoted, Liriano got back on track as he dominated AAA and showed the talent he displayed during his rookie year. The Twins called him back up in August and Liriano did not disappoint. Liriano went eight starts before giving up more than three earned runs in a game and did not register a loss until his eleventh and final start since returning to the big leagues. With diminished velocity, Liriano relied less on his fastball and more on his off speed pitches which he learned to mix up more while in the minors. After learning how to pitch in the majors again, Liriano now seems poised to be one of the leading men of the Twins rotation. Scott Baker had a much more subdued climb to prominence in the Twins rotation. 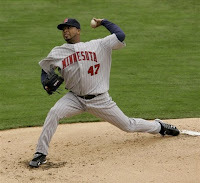 After a rough 2006 when he posted an ERA of 6.37, Baker was not in the rotation for 2007 as the Twins decided to give two spots to Ramon Ortiz and Sidney Ponson. Add those two names to the long list of awful free agent signings of the last five years. After the Ortiz/Ponson experiment went awry, Baker joined the rotation and stuck for the rest of the season. He finished the season 9-9 with an ERA of 4.26, great stats for a back of a rotation pitcher. Baker really arrived in 2007 on August 31st against the Royals at the Metrodome. Baker took a perfect game into the ninth inning before walking the leadoff man, and then lost the no-hitter with two outs left to go. It is the greatest Twins game I have ever witnessed in person and if it wasn’t for the man in the row behind me saying out loud, “Hey, Baker’s got a perfect game going!” right before the ninth inning, I think Baker would have done it. Baker was jinxed from the moment the words escaped his lips. Guy from section 120, row 34, seat 7, you owe Scott Baker and all us Twins fans an apology. With no real ace to lead the staff in 2008 after the Santana trade and Liriano injury, Baker stepped forward to become the unlikely leader of the rotation. The Twins went 17-11 in Baker’s starts, with Scott himself compiling an 11-4 record with an ERA of 3.45, the best in the Twins rotation. Even more impressive was Baker’s WHIP of 1.18, the fifth best in the AL, behind only Cliff Lee, Roy Halladay, Ervin Santana, and James Shields. That is some pretty good company to be associated with. Baker doesn’t have the ability to blow hitters away as his fastball tops out in the low 90’s, but he throws a changeup, curveball, and slider, all with good command. His ability to limit putting runners on base and command four pitches well give the Twins a reliable weapon to put at the front of the rotation. If asked today, Scott Baker is the ace of the Twins rotation. Liriano’s sample size is just too small from last season to bank on him pitching all of 2009 like the last two months of the 2008. They both have the ability to dominate a game with Liriano more likely to completely shut down an opponent. For consistency, Baker is the one to take. In twenty-eight starts last season, six runs were the most he gave up in a game, which happened once. He gave up five runs only once as well. In twenty-six starts, Baker gave up four runs or less, effectively keeping the Twins in all of those games. The Twins lost three games Baker started 1-0, two of the losses going against Baker’s record. If Baker repeats 2008 and the Twins give him a little run support, there will be a lot more talk about Scott Baker around Major League Baseball. Verdict: Scott Baker, Twins new staff ace.